A few days ago I posted about our plans on support.x-tensive.com service and asked you, our dear customers, users and followers, to register on it in order to make data migration process and author association simpler and more transparent. Associate authors of topics & replies in old forum with posts in new support website. 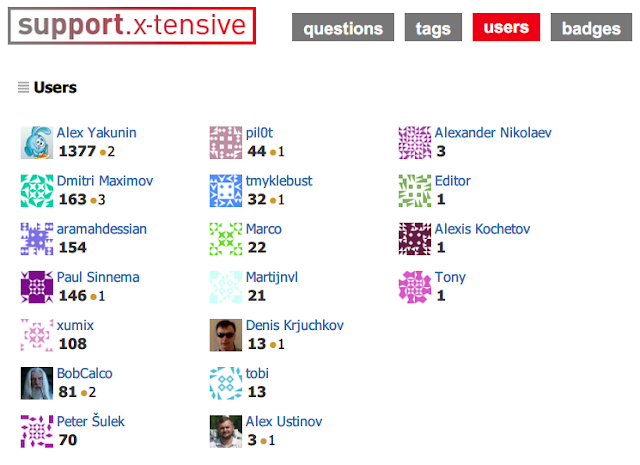 Calculate and set level of karma to authors according to their activity in old forum. It is not a surprise that the blue rabbit has got maximum level of karma, as it is working night and day 24x7 on the support forum. Our congratulations to leaders: aramahdessian, Paul Sinnema, xumix and all other contributors. I suppose, we'll wait a week or two in case anyone else decides to join and earn karma for his participation in old forum, and after that we'll do final migration to the new version of support service.